When the microphone and questions are turned toward the journalist or researcher they tend to cringe. It’s uncomfortable to be the object of study. In fact, many of us have been trained to believe that we are not a part of the study — the self must be aloof, detached, objective. Of course this mindset has shifted in some fields of work, including my own, but even those of us who champion self-reflective, feminist methods of positionality can be reticent to step to the other side of the researcher-subject relationship. Yet, that’s exactly what I had to do this past semester. I or more specifically my genes became the object of study. Last semester tested my resolve and resilience in ways I did not expect to encounter during my PhD program. Yet, family health concerns (and my own) do not wait for coursework to be over, comprehensive exams to be planned, or dissertation proposals to be written. Instead, I had to adapt without missing a beat (or at least too many). Thankfully the faculty in my program are super supportive. One class even provided the opportunity to complete an autoethnography project of sorts. Autoethnography is a method I never thought I would employ, nor did I think I would be willing to share the results. 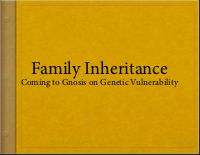 This project, entitled Family Inheritance, examines the concept of vulnerability in terms of genetics and cancer risk. It was an emotionally difficult and draining project. However, I do not think I could have completed research and work in my usual area of study without the cathartic process autoethnography provided. My focus — mental, physical, and emotional — was so wrapped up in my family this past semester that little else could catch my attention. 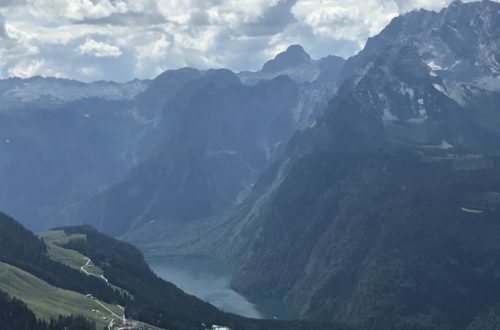 I have decided to share this project here because I believe it’s important to 1) acknowledge our human limits as scholars, 2) recognize that putting the self in research can reinvigorate interest, provide space for exploring new ideas, and 3) serve as empathy building experience for those we work with in research. Lastly, sharing Family Inheritance publicly is the final step of the project itself. As you’ll read in the theoretical positioning, I undertook the work to come to gnosis about genetic vulnerability through narrative. Keeping the narrative to myself did help immensely, but to fully integrate the concept into myself I think it is important to speak it. Below is the visual essay component of the project. The layout is in a family album format, so it is best viewed zoomed out or in a separate window. To view the visual essay in a different tab, follow this link. Below is the theoretical positioning essay. This essay addresses the method, theory, and reflection parts of the project. Viewing Family Inheritance would not be complete without reading the essay.